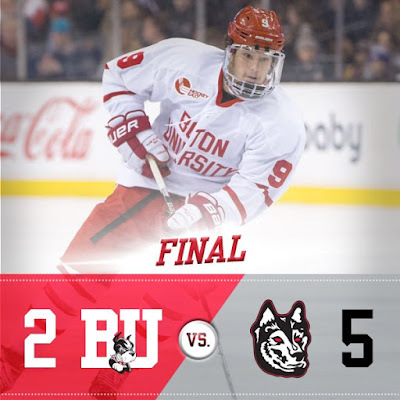 #20 Terriers were defeated by #12 Northeastern, 5-2, as the Huskies claimed their first Beanpot Championship since 1988. For BU, it was the third consecutive loss in the tournament’s title game and the loss ended a nine-game unbeaten streak. Northeastern was led by tournament MVP Adam Gaudette’s hat trick, while BU received goals from freshmen Logan Cockerill and Shane Bowers. While the Terriers outshot Northeastern, 40-27, the Huskies’ power play was a perfect three-for-three. They also had an empty-net goal. BU appeared to take the lead just two minutes into the first when Bowers converted the loose puck after Brady Tkachuk’s rush to the net, but the goal was waived off for goalie interference. The Terriers got one that counted at 12:35 when Cockerill banked a shot off goalie Cayden Primeau’s stick with assists to Hank Crone and Chad Krys. Northeastern replied with two power play goals, the first by Nolan Stevens at 14:38 and then a score by Gaudette at 17:32, to take a 2-1 lead after one. In a frustrating second period for the Terriers, they outshot Northeastern, 14-6, yet they yielded the period’s only two goals. With five minutes left in the period, defenseman Trevor Owens moved in from the point and drilled a shot to the top corner, stick side. Then, on another power play, Gaudette’s shot from the corner hit Jake Oettinger in the back and fell into the net for a 4-1 lead. BU had another big shot advantage in the third period, 16-7, but couldn’t crack Primeau until 17:20 when Bowers scored an extra-attacker goal, sliding home his own rebound after redirecting Cockerill’s shot. Dante Fabbro also assisted. But that was as close as the Terriers would get and Gaudette completed his hat trick with an ENG in the final minute. Bowers’ goal was his 16th, tops for all Division 1 freshmen. Terriers take on #3 Boston College in the Women’s Beanpot Final at Conte Forum tonight. Puck drop is set for 7:30 p.m. for the contest that will be live-streamed on ESPN3. BU is in the title game for the fourth time since becoming a Division 1 program. The Terriers took home the Beanpot in 1981 while a club team. In two earlier meetings this season, BU dropped a 4-3 decision to BC and then tied the Eagles, 2-2.